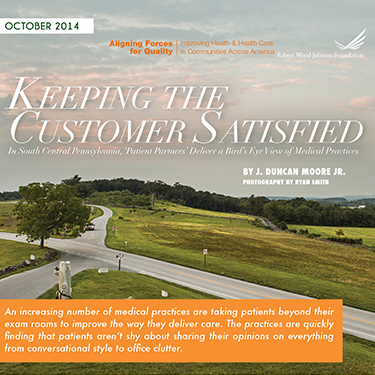 "[Patient partners] bring a robustness and richness to health care in so many different ways." Health care leaders in South Central Pennsylvania are turning patients into partners in their own care, taking them behind the scenes at local medical practices to get their insights on how to create a better health care system. Participating patients report higher levels of “activation” than other practices, while medical practices are getting unique feedback into how to improve the way they deliver care. These efforts are led by AF4Q-SCPA, one of RWJF’s Aligning Forces for Quality (AF4Q) communities, which has brought together providers, patients, employers and insurers to help improve regional health care.